The term “local” is used constantly when it comes to beer, to the point that there is some backlash against local-centric beer culture. Just because a beer is local doesn’t mean it’s good, and the term local is also very vague. Local beer will always be a relative term, whether it’s a beer brewed in your town, in your county, in your state, in your region, in your country, on your continent, etc. (I’ll assume all the beers you drink are from this planet, but it you have any ET beers I’d love to try them). I named this blog “Hoppy Boston” because I live in metro Boston and wanted to focus my articles on beers that were available for sale in Metro Boston. I would get frustrated when I would read a review of a beer, think it sounds amazing, and then find out that the only way to try it would be to fly to the west coast. While I have reviewed beers from all over the country that are available locally, I’ve made a concerted effort to focus on New England beers on this blog. This delineation is very arbitrary, why should I count beers brewed in Connecticut as “local” but beers from New York or Pennsylvania don’t make the cut? I guess you have to draw a line somewhere. Regardless, I do drink beers from all over the country, and I try to make an effort to mix in reviews from non-New England breweries from time to time. I’ve been sampling some quality New York beers recently, there are a few breweries that just started distributing to MA and complement the strong showing from established NY breweries. 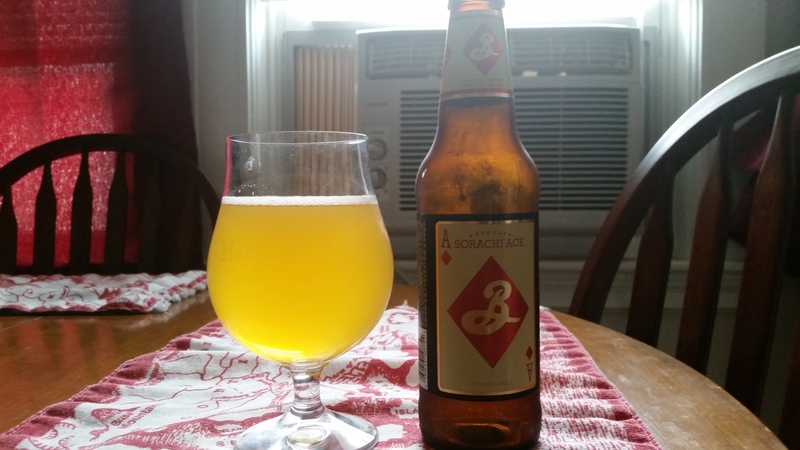 One beer I haven’t had in a while and wanted to review is Sorachi Ace from Brooklyn Brewery. Sorachi Ace is a saison brewed with the eponymous variety of hops, a rare breed developed in Japan. Brooklyn Brewery Sorachi Ace pours a hazy straw yellow with a mild white head. The scent is a mixture of fruity and spicy yeast mingling with some herbal hoppiness. The yeast leads the flavor, touches of apple, pepper, coriander and pear. This is followed by the unique hop flavors from the Sorachi Ace variety, notes of lemon, grass, orange and earth. The malts fill out the backbone with a little biscuit and whole grain flavor. Sorachi Ace is smooth, light bodied and goes down easy, but packs some punch at 7.2% ABV. The finish is crisp with some residual fruity hops and estery yeast. Brooklyn Brewery Sorachi Ace is a unique beer, the unusual hop variety pairs very well with the yeast strain. Definitely worth trying, even if you are a New England centric beer drinker! Hoppy Boston score: 4.25/5.